Nigeria’s plans to boost the role played by manufacturing in the broader economy as part of its diversification efforts are analysed in a new report from the global research and consultancy firm Oxford Business Group (OBG). The Report: Nigeria 2019 maps out the segments of the industrial sector that are being primed for growth, which include agro-processing, biofuels, cement, automobiles and fast-moving consumer goods. With infrastructure upgrades earmarked for a crucial part in moving the non-oil sector forward, OBG’s publication tracks both the latest developments in Nigeria’s project rollout and the steps being taken to increase the contribution made by private industry players to new ventures. The report also looks in detail at the move under way to boost the country’s ICT industry and increase broadband penetration, against a backdrop of rising smartphone usage. As Africa’s largest oil exporter and buoyed by rising prices, Nigeria remains keen to ensure that its hydrocarbons sector reaches full potential, even as the national diversification drive gathers pace. The Report: Nigeria 2019 highlights the untapped opportunities that the country’s natural gas fields offer and the interest they are generating among investors. It also shines a spotlight on the broad-based efforts to expand Nigeria’s refining capacity, which include boosting private-sector participation. In separate coverage, OBG’s report puts the city of Abuja under the microscope, charting the rapid urbanisation under way in the Federal Capital Territory, which is galvanising investment in infrastructure and real estate. The Report: Nigeria 2019 contains a viewpoint from President Muhammadu Buhari, together with a detailed sector-by-sector guide for investors. It also features a wide range of contributions from other high-profile personalities, including: Muhammad Musa Bello, Minister of the Federal Capital Territory; Babatunde Fowler, Executive Chairman, Federal Inland Revenue Service; Yewande Sadiku, Executive Secretary, Nigerian Investment Promotion Commission; and Babatunde Paul Ruwase, President, Lagos Chamber of Commerce and Industry. Commenting ahead of the launch, OBG’s Editor-in-Chief, Oliver Cornock, said that while Nigeria still had more to do to boost non-oil expansion, new incentives introduced across the manufacturing industry, combined with a planned infrastructure drive, were expected to accelerate investment and economic activity. Souhir Mzali, OBG’s Regional Editor for Africa, added that rising crude oil prices, a growing consumer market and stronger regional links had helped Nigeria to up the tempo of its industrial expansion at a significant point in the country’s development. 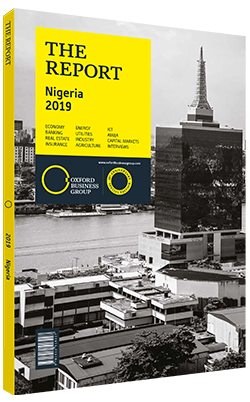 The Report: Nigeria 2019 marks the culmination of more than 12 months of field research by a team of analysts from Oxford Business Group. The publication assesses trends and developments across the country, including infrastructure, financial services, industrye and ICT. The Report: Nigeria 2019 has been produced in partnership with the Nigerian Investment Promotion Commission and the Lagos Chamber of Commerce and Industry. Contributions have also been made by FBNQuest Merchant Bank, Coronation Merchant Bank, Grant Thornton Nigeria and Stillwaters Law Firm. It is available online and in print. Oxford Business Group (OBG) is a global research and consultancy company with a presence in over 30 countries, from Africa, Asia and the Middle East to the Americas. A distinctive and respected provider of on-the-ground intelligence on many of the world’s fastest growing markets, OBG has offices in London, Berlin, Dubai and Istanbul, and a network of local bureaus across the countries in which we operate.